Best Gun Loans In St. Louis - What's New! St.Louis Gun Loans, dba Southside Pawn, is the premier lender on all firearms in the St.Louis Metro area. Our complete goal is to loan our customers the greatest amount of money possible on their valuable firearms. Law Enforcement, Military and sport shooting experience, coupled with 16 years of loaning top dollar on every type of firearm imaginable, gives our customers the true satisfaction of knowing they have received the best possible loan. When the need for quick cash arises, this is when our customers appreciate our intention to maximize the money we give on every firearm. Nobody needs an unfair hassle about any loan during a time of importance. It's at this time our store and staff makes lasting customers forever. Special note should be made that we sell over 40 different brands and styles of new firearms, which keeps us right up to date on all current prices! We service Webster, Kirkwood, Sunset Hills, Oakville, Fenton, South County, Crestwood, Shrewsberry, and Lemay. Here at St. Louis Gun Loans, we have a very special enthusiasm for hand gun loans. A lifetime member of the NRA, and a big supporter of the new Missouri conceal and carry law, we expect and do get many requests for hand gun loans. The cost of new hand guns is certainly not cheap. With that in mind our staff knows that our store position is to loan the maximum amount we can on each and every handgun. Our customers visit our store repeatedly when needed, because they simply have the experience and knowledge that we willingly loan top dollar on hand guns. 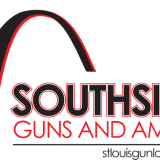 Visit Southside Guns and Ammo today to find out why we're the best gun loan experts in St. Louis! Both the site and the new gun store look awesome! What an inviting and terrific staff you have! We will beat almost any price online or in store!